The tesla (symbol T) is a unit of measurement of the strength of a magnetic field. 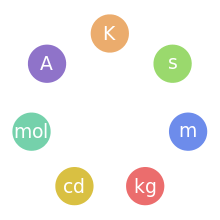 It is a derived unit of the International System of Units, the modern form of the metric system. The strongest fields encountered from permanent magnets are from Halbach spheres which can be over 4.5 T. The strongest field trapped in a laboratory superconductor as of June 2014 is 21 T. The record magnetic field has been produced by scientists at the Los Alamos National Laboratory campus of the National High Magnetic Field Laboratory, the world's first 100-tesla, non-destructive magnetic field. In the production of the Lorentz force, the difference between these fields is that a force from a magnetic field on a charged particle is generally due to the charged particle's movement, while the force imparted by an electric field on a charged particle is not due to the charged particle's movement. This may be appreciated by looking at the units for each. The unit of electric field in the MKS system of units is newtons per coulomb, N/C, while the magnetic field (in teslas) can be written as N/(C·m/s). The dividing factor between the two types of field is metres/second (m/s), which is velocity. This relationship immediately highlights the fact that whether a static electromagnetic field is seen as purely magnetic, or purely electric, or some combination of these, is dependent upon one's reference frame (that is: one's velocity relative to the field). One tesla is equal to 1 Vs/m2. This can be shown by starting with the speed of light in vacuum, c=(εoμo)−1/2, and inserting the SI values and units for c (2.998x108 m/s), the vacuum permittivity (εo=8.85x10−12 As/Vm), and the vacuum permeability (μo=12.566x10−7 Tm/A). Cancellation of numbers and units then produces this relation. ↑ "Details of SI units". sizes.com. 2011-07-01. Retrieved 2011-10-04. ↑ "Strongest non-destructive magnetic field: world record set at 100-tesla level". Los Alamos National Laboratory. Retrieved 6 November 2014. ↑ Gregory, Frederick (2003). History of Science 1700 to Present. The Teaching Company. ↑ Parker, Eugene (2007). Conversations on electric and magnetic fields in the cosmos. Princeton University press. p. 65. ↑ Kurt, Oughstun (2006). Electromagnetic and optical pulse propagation. Springer. p. 81. ↑ Herman, Stephen (2003). Delmar's standard textbook of electricity. Delmar Publishers. p. 97. ↑ "Ultra-High Field". Bruker BioSpin. Retrieved 2011-10-04. ↑ "Superconducting Magnet in CMS". Retrieved 9 February 2013. ↑ "ISEULT - INUMAC". Retrieved 17 February 2014. ↑ "ITER – the way to new energy". Retrieved 2012-04-19. ↑ "Of Flying Frogs and Levitrons" by M.V. Berry and A.K. Geim, European Journal of Physics, v. 18, 1997, p. 307–13." (PDF). Retrieved 12 May 2013. ↑ "Superconductor Traps The Strongest Magnetic Field Yet". Retrieved 2 July 2014. 1 2 "Mag Lab World Records". Media Center. National High Magnetic Field Laboratory, USA. 2008. Retrieved 2015-10-24.